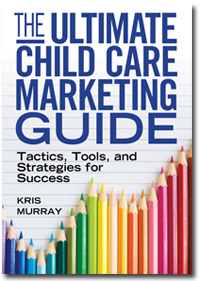 In my book, The Ultimate Child Care Marketing Guide, I teach eight key ingredients that should be included in every marketing piece for your child care center, daycare, or preschool. There are, however, two essential elements out of those eight that you can really concentrate on to make your marketing more effective. The first is social proof, such as parent testimonials, and the second is a focus on the unique benefits of your center. Social proof is a great method to build trust with a parent or prospect. Interspersing your ad with parent testimonials, stories, or even multiple testimonials will work wonders. 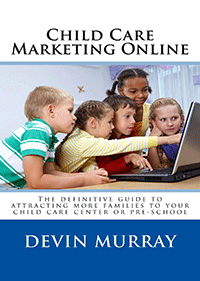 In fact, your entire ad could be focused on the story of a child or family that is enrolled in your school. 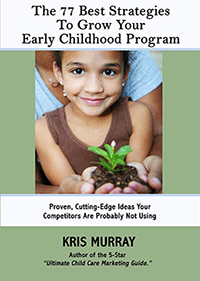 I’ve seen this strategy used on several websites of leading child care centers, and it’s been a huge factor contributing to their success. They use social proof because it works! Parents really are out there looking for what other parents are saying about your center to help them form an opinion. Take a minute to look at every brochure, ad, mailer, and flyer about your center to see if it features any good, credible, solid, benefit-driven parent testimonials. If it doesn’t, think about how you can incorporate testimonials into your marketing, or how you can even create a whole campaign just using this method. For example, you could use a parent’s story about how their child benefited from being in your program for five years by being placed in the gifted program after attending your school. Any stories you have that tie in with your brand can be used in your marketing. Don’t have any testimonials or stories? It’s time to get to work! I have lots of blog posts that teach you how to get these. The second important element to integrate into your marketing is to communicate the unique benefits of your program. These are the differences that set you apart from other centers. Most in the child care industry have really lost focus on this essential ingredient and, in turn, have commoditized the industry. This means that some parents now believe all centers are similar and that they should therefore only ask about rates. We all know this isn’t the case! What makes your center special and unique? In your marketing, make sure to focus on bullet point benefits that explain how your business is different from the rest. These unique benefits should be a part of every marketing piece, and should also be a main focus on your website. This should be what your employees talk about when they respond to inquiries on the phone and give tours. It’s so important to constantly be communicating those unique differences across your messaging to parents. That will pull you out of being a simple commodity that blends in with the others, really setting you apart from competition, and finally allow you to charge what you’re worth. If you integrate just these two ingredients into your communications, you will be on your way to more effective marketing, driving more inquiries and ultimately more enrollments at your child care. To your success!